Have a little spare time and something to say? Your chance to have your blog published and win some cash! All entries are to be in by Midnight November 25th. All entries and any photographs will be featured on our website. The top 5 entries as decided by the MFF team will be put up on FB and people will be able to vote for their favourite blog. Blogs must be FIFO related and will not be allowed to promote individual organisations, weight loss pills companies or products. This competition is open to anyone! The winner will be announced on Dec 5th. First prize will be $500 cash and an invitation to supply 3 guest blogs. The winner may promote their own blog (if they have one). 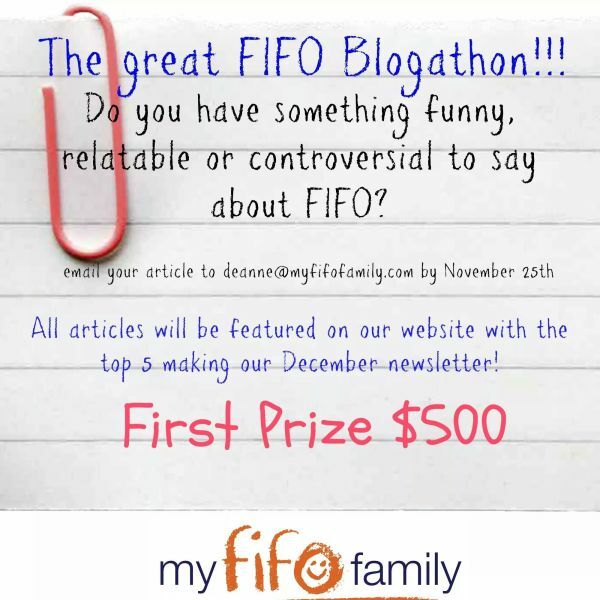 Any queries feel free to email the team at info@myfifofamily.com Good luck and happy blogging!!!! Click here to read our wonderful Blogathon guest entries!